335 Jeanette Barrett Industrial Blvd. A groundbreaking ceremony for the Millbrook Business Park at 2800 Grandview Road is set for 2 p.m. today. Partners on the project are the City of Millbrook, the Elmore County Commission, the Central Alabama Electric Cooperative, and the Elmore County Economic Development Authority. This rendering shows the layout of the new Millbrook Business Park. 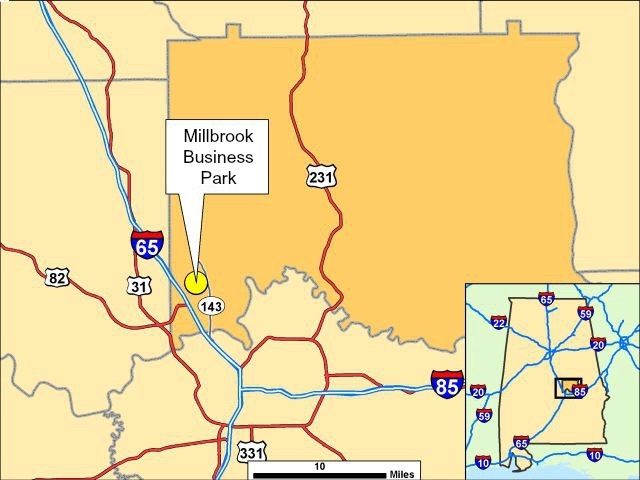 This map shows the proximity of the new Millbrook Business Park to I-65. 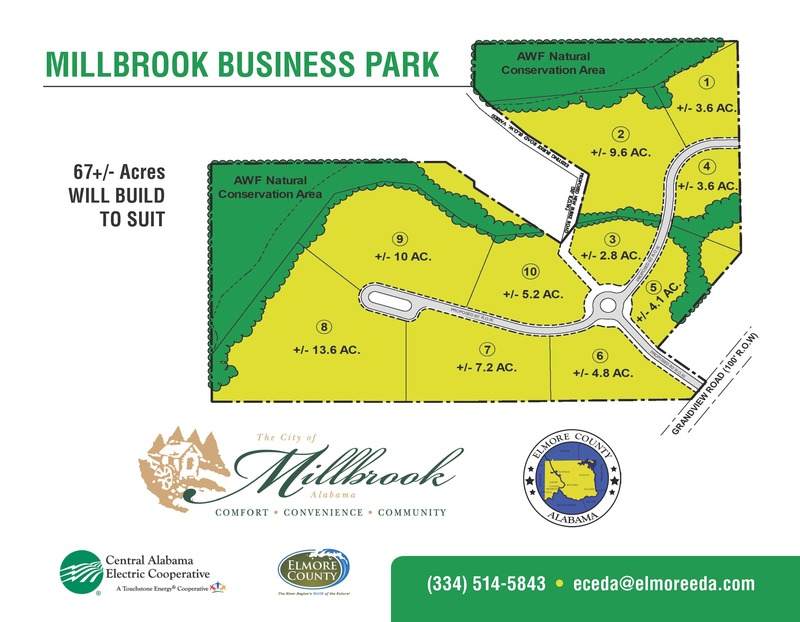 According to the Elmore County EDA, Millbrook Business Park spans 89.5 total acres and adjoins a natural conservation area administered by the Alabama Wildlife Federation. The park has 10 lots available for development, ranging in size from 2.8 acres to 13.6 acres, totaling more than 69 acres of developable land. The Elmore County EDA is actively recruiting light industrial, technology-focused companies, and other businesses to the park. Elmore County EDA Director Leisa Finley said plans call for the park to eventually earn an AdvantageSite designation under a program managed by the Economic Development Partnership of Alabama (EDPA). The Alabama Department of Commerce is one of the sponsors of the AdvantageSite initiative, which is a voluntary industrial site preparedness program created to make the state more competitive for companies considering a location in Alabama. There are currently 56 AdvantageSites across the state, according to the EDPA. Millbrook, whose population today numbers around 15,000, has regularly been ranked among the state’s most rapidly growing cities. Between 2000 and 2010, its population count surged by 37 percent; during the prior decade, it grew 43 percent. – Original article by Jerry Underwood. Read the article on madeinalabama.com.